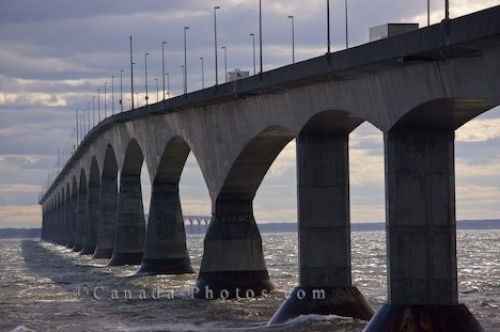 The Confederation Bridge in Prince Edward Island, Canada is a unique building structure that crosses the Northumberland Strait into New Brunswick. Standing at Borden-Carlton in Queens in Prince Edward Island you can see how the structure of the Confederation Bridge was uniquely built. This structure runs for nine miles over the Northumberland Strait and thousands use the bridge daily to get between Prince Edward Island and New Brunswick. Picture of the interesting structure that makes up Confederation Bridge as seen from Borden-Carleton in Prince Edward Island.